Highlands is a locally owned and operated hospital in Connellsville, Pennsylvania. Ours is located in a uniquely beautiful setting, situated amongst the picturesque Laurel Mountains in the Southwestern part of the state. 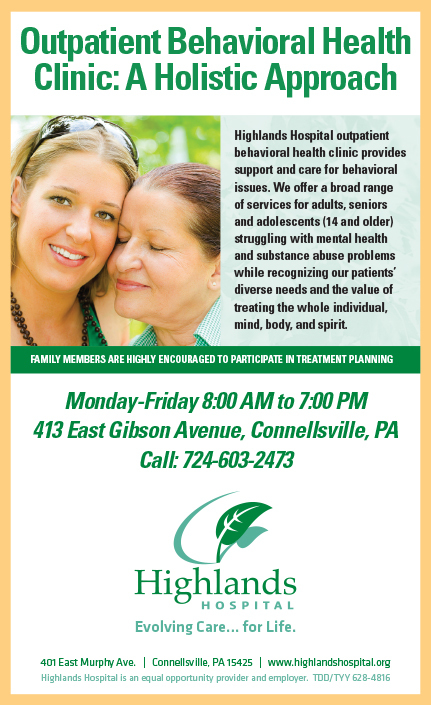 We offer a broad spectrum of health care services, and two, 24-hour behavioral health programs. Highlands Hospital is the only behavioral facility in Fayette County to provide inpatient care to adolescents as well as adults, and we are particularly dedicated to offering personalized health care that address the whole person. The in-patient behavioral health programs at Highlands are designed to meet the needs of individuals during two distinctive points in life. Tranquility at Highlands is a 19-bed, secured in-patient adolescent and adult behavioral health unit, serving patients between the ages of 14 and 64. Reflections at Highlands is a behavioral health unit which concentrates upon the needs of the geriatric community. The secured, 12-bed in-patient unit serves patients ages 65 and over. Both programs administer daily curriculums which have been developed by seasoned health care professionals. Tranquility and Reflections at Highlands place an emphasis on patients’ active participation in the recovery process. The Tranquility behavioral health unit at Highlands accepts patients between the ages of 14 and 64 with any behavioral disorder. We understand that those in the Tranquility program are experiencing some of the most monumental times of their lives, and we make great strides to provide them with an expertly-devised curriculum that takes this into consideration. Our professionals consider not only the developmental needs of their patients, but also their physical, psychological, emotional, and spiritual well-being. Age-specific therapy and evaluation is applied to patients in Tranquility at Highlands, given the wide range of ages in the program. The treatment is broken into two distinct platforms, both of which focus on the respective needs of our varied patient population.